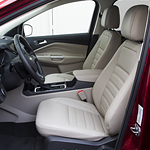 New Ford Escape Made For Convenience | Robberson Ford Sales Inc. The new Ford Escape makes life easier with a variety of convenience features. The cargo capacity is impressive. Folding both the rear seats allows for more than 68 cubic feet of cargo space. Even with both seats up, you still get a whopping 38 feet of good cargo space. Loading your cargo gets even more simple with the car's foot activated lift gate. Simply stick your foot under the car's bumper to open the liftgate. No need to set all your cargo down or fumble around to find your keys to open the back of your car. Opening and unlocking other doors of your car is also a breeze. The Intelligent Access Key just has to be in your pocket or purse when you touch the door handles. Inside of the car, simply push the start button to switch everything on. More convenience features are available in the new Ford Escape. Visit Robberson Ford Sales Inc. in Bend to see more of them today.